November 1942. "Production. Copper. 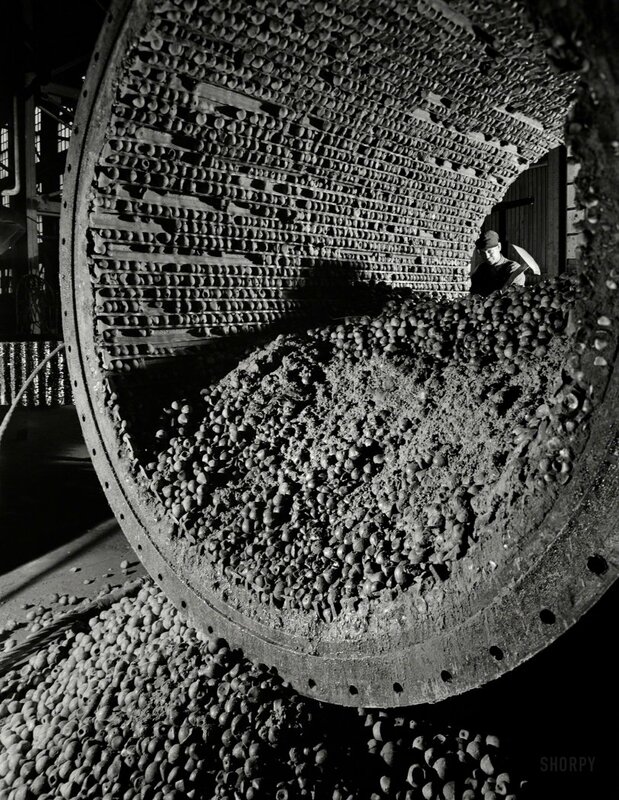 Interior of large ball mill showing the iron balls which grind the ore to a fine size for subsequent treatment by flotation at one of the mills of the Utah Copper Company in Magna and Arthur." 4x5 nitrate negative by Andreas Feininger for the Office of War Information. View full size. Submitted by HAL on Sun, 09/10/2017 - 5:52pm. This looks like a 10 ton per hour roller mill using 6 pound shot. What this worker is doing removing the shot with the ground up ore clinging to the shot. It is an extremely dangerous job with the shot hanging on the wall of the roller mill. Current price of shot this size is about $30.00 per shot. The price of the mill is about $50,000.00.